Stewart’s Division begins its attack on the Kelly Field position. Buckner’s Corps Reserve Artillery battalion moves up with the army Reserve Artillery battalion. Both battalions begin shelling the Union forces seen moving in Kelly Field. 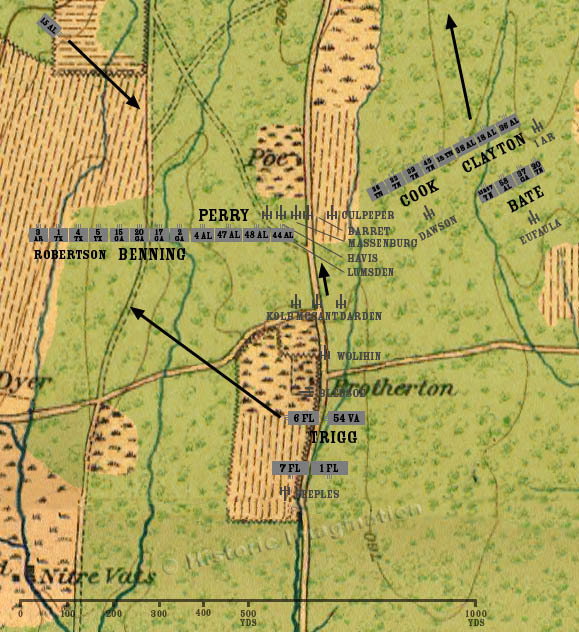 The 15th Alabama continues moving south on its way to rejoining Perry’s brigade. Trigg’s Brigade is ordered to rejoin the rest of Preston’s Division. The 6th Florida and 54th Virginia move first. The rest of the brigade has not yet, or is just now, returning from its patrol to the south.